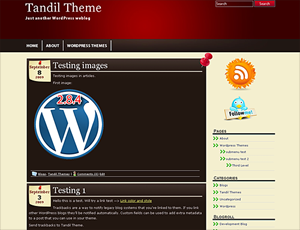 Hello there, I’m releasing version 1.3.6 of Tandil WordPress Theme today! Facebook Support was added. You can add your facebook url and activate it from the admin panel. It will show along with Twitter and RSS. Another improvement is the options panel. The URLs were “sanitized” to avoid undesirable characters to display in the output. It may sound too technical, I know. Basically it’s to comply with the latest wordpress version security demands. As always, you contact me if you need support. Hello Werner, yes your site looks ideal to make use of Tandil Theme. I will send you an email. Cheers, Alex. Awesome theme. I am looking to put a picture in the header instead of the text. Can this be accomplished ? Thank you in advance. Hello Jeff, I think you were able to add the pic, right? Contact me if you still need help. Greetings, Alex.